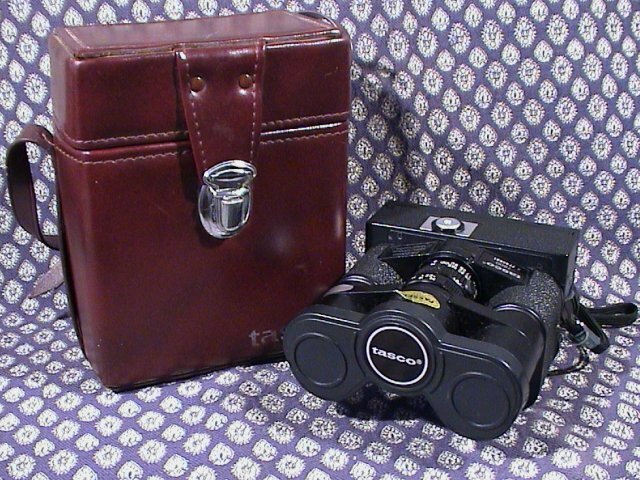 The concept of combining a pair of binoculars and a camera was seen in the early 1950 s with the Binoca and Toko Cyclops and Teleca and in 1956 with the excellent CamBinox with 35mm, 90mm and 135mm lenses. 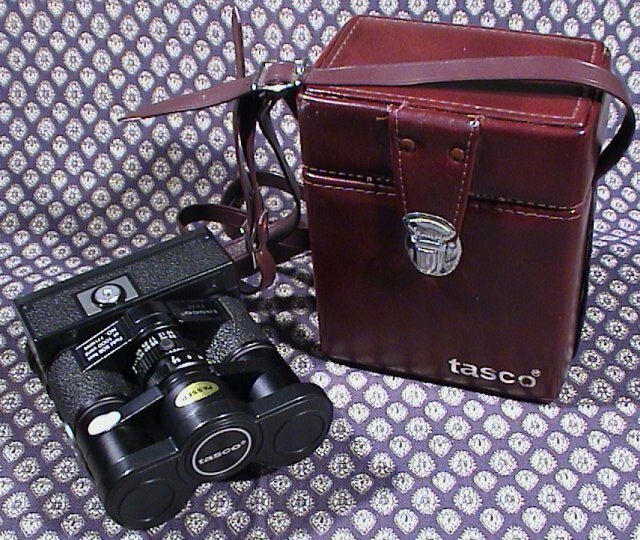 It was not until 1977 that the next subminiature format camera was mounted on the top of a pair of binoculars in the form of the Tasco Binoc/Cam 7800 and the similar Orinox both using 110 format. The telephoto lens of the 110 camera is mount between the two lenses of the binoculars. The oculars can be independently adjusted from -4 to +2 dioptres. Although the optics are good, lens bright and sharp the camera body is very simple and not built to the same quality as the binoculars. Identical to the 7800 (below), but without being labelled 7800. 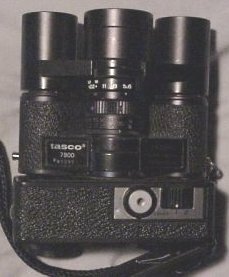 The 7800 has a 112mm lens, the front elements of which can unscrew but there were no alternatives made. The lens has focusing from 10 m (33 feet) to infinity and is coupled to the binocular lenses. The binoculars are rated 7x20mm 508ft/1000yds (169m/1000m) and have a white frame when set so that the oculars are at the correct distance apart for the user. Only the right hand lens moves and the camera is off set at an angle. Aperture adjust is on the barrel of the telephoto from f5.6 down to f22. The single speed mechanical shutter is 1/125 s. The slow lens and long telephoto (about 220mm on a 35mm camera) risk camera shake so it has a solid tripod mount on the left hand side of the binoculars and a socket in the shutter release for the use of a mechanical timer or cable release. 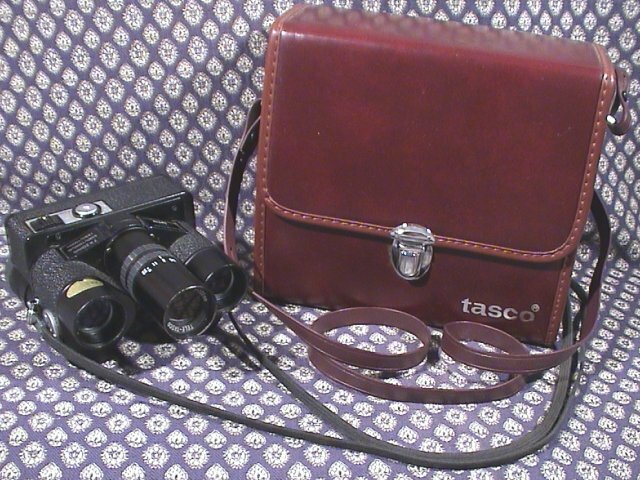 An accessory kit was sold with table top tripod, three 32mm filters (1A, Y48 and ND2), lens hood and a pair of eye cups to replace those on the binocular oculars. The burgundy case is imitation leather with a gold coloured logo on the front lower right. The camera was manufactured between 1977 and 1981. The improved version retains the 112mm focusing lens of the 7800, the tripod and cable release sockets, the 7x20mm binoculars but now has a two speed camera on the top, 1/125 and 1/250 s.
The last in the series of Bino/Cam was the 8000 manufactured from 1980 until 1983. The focusing of binoculars and telephoto was dropped but the lens is now interchangeable and three lens options were available. The standard 100mm f5.6-22 lens is equivalent to a 200mm on a 35mm camera. The other lenses sold where a 70mm and a 150mm. The variable focus of the 7800 is easier to use as binoculars. The camera has two speeds, like the 7900, of 1/125 and 1/250s marked 1 and 2. The accessory kit is similar to that for the 7800 but has a 26mm thread for the filters and hood. The burgundy case is imitation leather with a gold coloured logo on the front lower right and has space for both extra lenses or film.